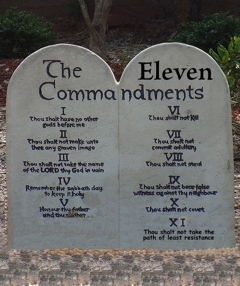 I doubt any ‘by the book’ Christians are here to take offense, so I’ll propose an 11th Commandment… Thou shalt not take the path of least resistance. It has a nice ring to it, yet I’ll admit it sounds a little unnatural. After all, we didn’t evolve biologically to ‘take the path of least resistance’. Neither are we set up biologically to eat grains, drive cars, or the countless other things we do to make life more convenient, comfortable and secure. In the wild, taking the path of least resistance is naturally healthful. In civilized settings, results often turn out otherwise. The natural and innate drive to take the path of least resistance is a key driving force behind the invention of tools and by extension civilization itself. If you doubt that, just imagine life without any tools, not even a stone axe. Tool use is the cornerstone of civilization. By making the path of least resistance increasingly easier to trod, civilization unwittingly produces a path of inherent imbalance. This imbalance increases with every technological advancement we make. The shift from hunter-gatherer to agriculture was a major milestone. Archeological evidence shows that the following 10,000 years marked a decline in human physical health. Fortunately, human physical health has recovered greatly through improved sanitation and science over the last few centuries. Human mental health is a whole other matter. The more recent advent of the Iron Age (1200 BCE) certainly instigated a major decline in human mental health… a decline that shows no signs of recovery. That may be a leap, but there is some evidence… sort of. The symptom’s point of view vis-à-vis religion points me to this conclusion. My proposed 11th commandment parallels Buddha’s Second Noble Truth, which in part says, “… the desire to live for the enjoyment of self entangles us in a net of sorrow, pleasures are the bait and the result is pain.” One of the problems I have with the Ten Commandments, or even my 11th one, is that without lucid evidence based on experience, commandments easily become simple platitudes. Just because everyone says something is important has never worked for me. I need proof! Sure, my less social and contrarian nature accounts for some of this. However, I bet I’m not alone! Everyone is less or more social and less or more contrarian. Having a coherent reason for approaching life the way one thinks best can only help. Knowing ‘why’ makes fulfilling chapter 21’s, In his every movement a man of great virtue follows the way and the way only nearly certain. Knowing what is in my best interest and why makes it nearly impossible to do otherwise.